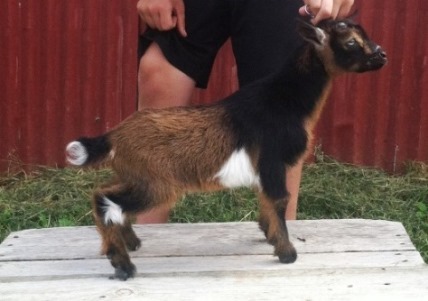 DOB: 2/25/12 (Twin) Height: 20 1/2"
Dam: SG Kaapio Acres HH Redemption *M *DAR VEEE90, ADGA Elite Doe 2016. 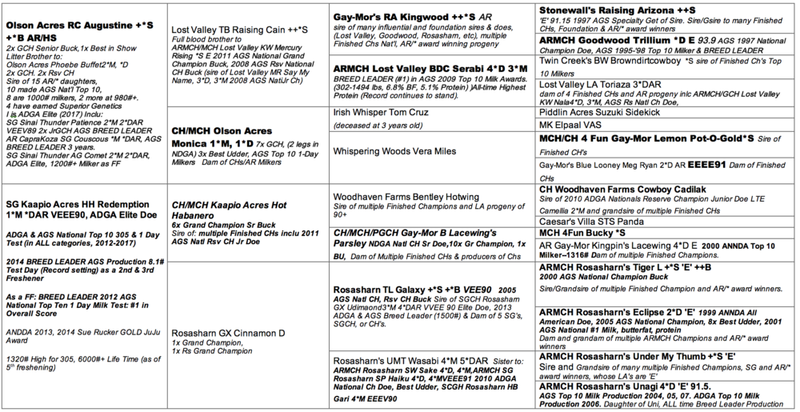 ADGA & AGS Top 10 305 & 1Day Test, Breed Leader & Record Setting Overall Score, Production. One of the greatest JOYS we had in 2015, was bringing this gorgeous doe back from our good friends at Sycamore Springs. We were so impressed when we saw how Faith had matured, that we repeated the breeding for Duchess & Sheba. Faith has had gorgeous kids, and since we are so impressed with her dam, we felt Faith would continue in Red's legacy. Its an added blessing that Faith is a pleasure to milk, & easily earned her Milk Stars in her 1st Test 2016 lactation. This year she started off with a bang----milked 4.6# on her 1st Test---and finally made it to 1000# for her 2017 DHI (305). As you can see in the photos, Faith is lovely, having wonderful length, a level top-line and a very good, wide rump. She's also very dairy, and carries her udder high, wide, & has a very smooth Fore.